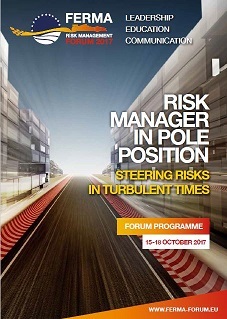 Risk Manager in Pole Position is the conference theme. FERMA is delighted to have as the opening keynote speaker Mark Gallagher, Managing Director for CMS Motor Sport and co-owner of Status Grand Prix. Mark has also held senior roles with the Jordan and Red Bull Racing Formula One teams. Steering risk in turbulent times is a second theme of the Forum. Experts from business, research and government will assess the risks and opportunities for Europe today as it faces Brexit, populism, protectionism, political upheavals and uncertainty over climate change mitigation. ICHEC from Belgium, ALP from Italy and the University of Malta, FERMA partners in the certification programme rimap®,are hosting three masterclasses before the start of the day’s sessions. The subjects are: risk management information systems in the age of Big Data; risk reporting to multiple audiences, and integrating internal control self-assessment and risk management. Risk managers can share common interests with their peers in the same industry sector across European borders. The first 100 risk managers, who are members of FERMA associations and register for the Forum before the end of June, can bring another risk manager to the Forum for FREE.